A. We are Steve and Jeff Wright, aided occasionally by Cliff Shrubb,(renowned frame builder), and we build specialist roof racks for team cars, and discerning racing cyclist, for the easy transportation of bicycles. We also build up custom racing cycles for Road, Track, and Cyclo-cross. (Mountain Bikes are only done by special request, as is any bike with anything other than Italian equipment!). Please see later pages for details of some of our customer bike builds. We offer full race support and service, and have a fully equipped Team Car capable of transporting up to three riders and six bikes to race meetings, anywhere in the UK or the Continent. If you need any race logistics, require a custom roof rack, or want a custom build of your race bike, email us at info@sgcyclery.com with your requirements. We are justly proud to look after Stephania Magri, the current Maltese Women’s National Road Race Champion,& National XC MTB Champion, Steve being her Primary Coach, and helping her with equipment and maintenance when she is in the UK. 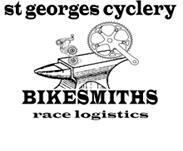 We also work in close partnership with Sutton Cycling Club, having supported the Club for the past four years, looking after their fleet of Race and Track bikes, carrying out the necessary repairs, and also supplying individuals in the club with race bikes and equipment. We also supply the ‘Team Car’, for Team QCP, who compete in the Women’s Team Series, and we are a common sight at most race venues nowadays, and it is also available for “Neutral Service” at any event, email for details of availability. The Team Car is in use for many race days as well as trips to events across the Channel in various areas of France. If you need to get people and bikes to a race meeting, maybe we can help.